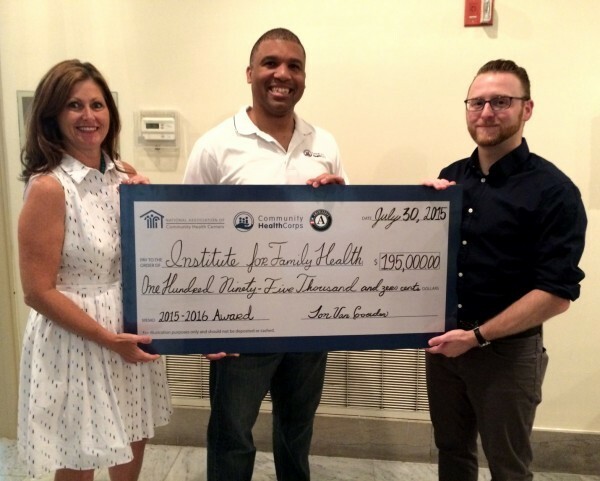 From left, the National Association of Community Health Centers‘ Deputy Director, Pamela Ferguson and National Director, Gerrard Jolly, present a $195,000 grant to Institute for Family Health Community HealthCorps Program Coordinator Chris Goodwin for the 2015-2016 Community HealthCorps Service Year. New York, NY (September 4, 2015) – This week, the Institute for Family Health joins in celebrating the 20th Anniversary of the Community HealthCorps program. The Institute has been a Community HealthCorps Program Site since 2006. This September, the Institute will welcome its 10th team of 20 AmeriCorps members. The Institute’s Community HealthCorps members serve as Prenatal Coordinators, Adolescent Health Educators and Diabetes Prevention and Education Coaches, among other positions. Since the inception of the program at the Institute, the Community HealthCorps teams have proven an invaluable resource, providing unique services affecting thousands of patients each year. “Community HealthCorps provides a two-fold opportunity for our AmeriCorps members to create healthy futures for the patients and communities they serve, while developing into the health and public service leaders of tomorrow,” explains National Director Gerrard Jolly. For the past twenty years, Community HealthCorps has leveraged the power of national service to enhance and expand the work of Community Health Centers in serving America’s medically underserved communities. Founded in 1995, by the National Association of Community Health Centers, Community HealthCorps is the largest health-focused AmeriCorps program, annually placing 535 individuals to serve full-time in over 200 communities throughout 17 states and the District of Columbia. Each year, Community HealthCorps Members facilitate over 500,000 health-related engagements increasing access for thousands of health center patients, and over a third of the program’s 7,000 alumni choose a career within community health or public service, as a direct result of their service. Learn more about our Community HealthCorps program here.